In July this year we invited acclaimed photographer Cathleen Naundorf to the V&A to shoot dazzling 1930s gowns from the museum’s collection, now on display in the first room of ‘Horst: Photographer of Style’, alongside vintage prints from the earliest decade of his long career with Vogue. These ensembles were designed by some of the leading couturiers of pre-war Paris, including Horst’s friend Elsa Schiaparelli, Lanvin, Molyneux, Rouff and Vionnet.Dramatically draped tulle, sheer organza, crêpe, shafts of silver lamé and lace, embellished with sequins, rhinestones and velvet appliqué – the dresses exemplify the fashionable elongated silhouette and delicate detailing of 1930s couture. It was through her friendship with Horst that Naundorf began photographing haute couture. They were both brought up, generations apart, in the East German town of Weissenfels and first met in New York in the early 1990s. They shared a passion for art and adventure. Horst became Naundorf’s mentor, encouraging the young travel photographer to start experimenting with fashion imagery. He helped her to develop a deeper understanding of light and atmosphere. “It’s the lighting, the drama,” she explains. “It’s called zwielichtin in German, the play of light. If you could see the way the light comes through the leaves in Weissenfels, you’d see where we both get it from.” She learned as much as she could from the man known as the master of light: “I was constantly asking him, how did you set up the light here? From which side? Which lamps? When I saw him I would come with magazines containing his pictures with my notes and drawings all over them.” In 2005 she embarked on the ongoing project Un Rêve de Mode, for which she was given access to the archives of six couture houses and permission to photograph their most exquisite creations in elaborate and dream-like settings. 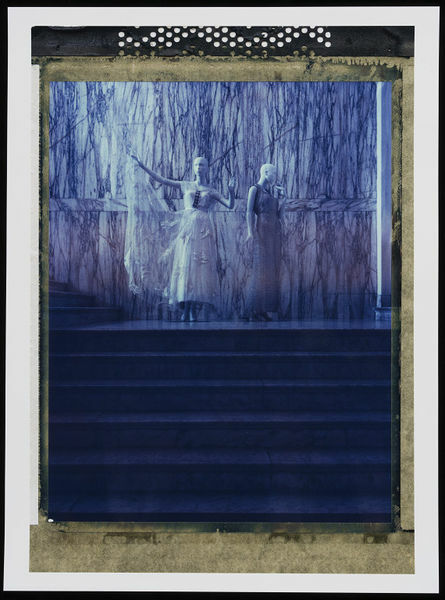 We visited numerous locations around the V&A in advance of the shoot, before deciding on two contrasting spaces – the Textile Conservation Studio, where the ensembles were expertly prepared in advance of the exhibition, and the grand marble staircase evocative of Horst’s classically inspired sets. 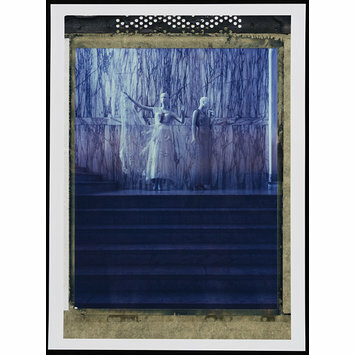 Naundorf works predominantly with a large-format camera (Deardorff or Plaubel) using Polaroid and Fuji instant film, a complex process compared with the digital technology that many of her contemporaries favour. Watching her work is thrilling: she shoots fast, flitting between colour and black-and-white film, and her advance planning means she knows precisely the mood that each picture should conjure. Sometimes she will interrupt the development process and transfer a Polaroid image to textured matt paper. The technique produces the seductive painterly effects and ghostly hues that have become her signature. Colour photograph depicting two mannequins clad in dresses standing at the top of a flight of stairs. Both dresses are light in colour and there is a marble wall behind them. Photograph by Cathleen Naundorf, 'The Legacy Lives On II', 30-31 July 2014, shooting at the V&A for the Horst P. Horst exhibition catalogue (published October 2014). Lambda print from original polaroid, printed 2016.